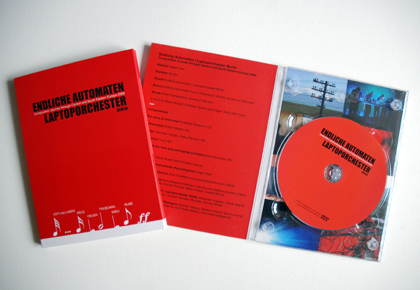 Between the 6th and the 30th of april 2009 the Endliche Automaten – Leptoporchester Berlin visited the cities of Usti nad Labem, Pécs, Osijek, Timisoara, Sibiu and Ruse during it's composition journey through Central- and Southastern Europe. In each city a regional composer composed a current creation, which has been rehearsed for three days after an audiovisual concert on site. The new compositions had their debut performance at the next location of the composition journey. So with the rising number of new compositions, the performance of original compositions of Endliche Automaten diminished. A completely new repertoire of genuine Central and Southeastern European soundscapes has been generated, furthermore, the artists locally created their audio-art for a foreign audience. So as an example: czech artists from the bohemian region, mediated by the Endliche Automaten - Laptoporchester Berlin, composed for the Hungarian, Croatian, Romanian and Bulgarian audience. The DVD contains the documetary of the Composition Journey and bonus material (one live concert) and a trailer. The Endliche Automaten are: Alexander Augsten, Marek Brandt, Shintaro Miyazaki, Stephane Leonard, Oliver Kiesow and Nicolas Weiser.